What is so special about ReFS is , the disk will be online all the time. This is to ensure there a protection for any data corruption to the data. In case it have, it have a built in mechanism that provide self healing. Of course there are certain thing that ReFS can't do which is booting the ReFS. 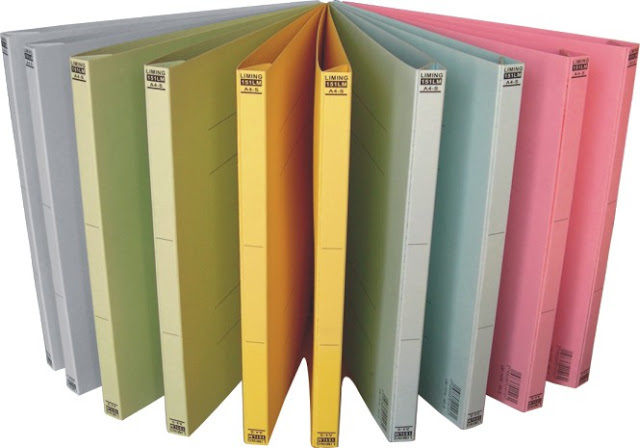 The advanced file system NTFS still need to be in place to support these. One thing that you must make sure before you deploy ReFS is, the file system only support on Windows Server 2012 as well as Windows 8. The rest of the operating system is not supported yet, but however it might have a change. Let see what Microsoft offer when the product it is release in production. On top of that also, the ReFS doesn't support EFS but that doesn't matter anyway. Let me tell you why. In Windows Server 2012, it does provide bitlocker which could encrypt the volume it self, it have a bit different that the previous version as this version during the encryption it only encrypted the portion that the data it reside. Other then that would be the disk quota it is not part of the ReFS, during the planning of the file server, you might want to take note of this. 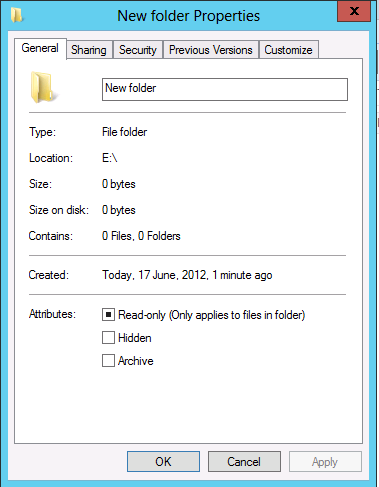 To start with, when we create a volume in Windows Server 2012, we have been given a selection of 3 files system. 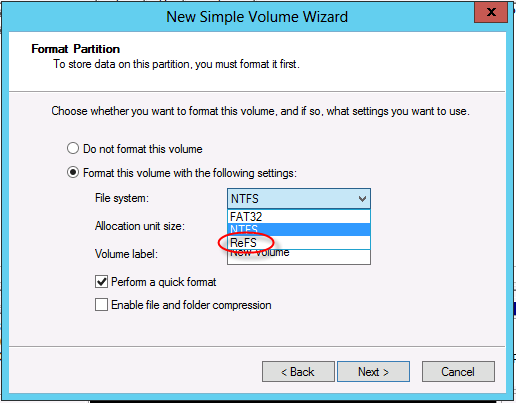 Well, you might have a question such as what are the differences on the folder that is stored inside NTFS and ReFS. Take a look at the picture below. 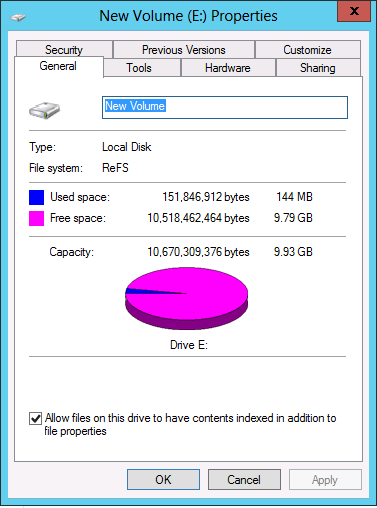 This is the normal NTFS files system. While on those folders that are reside in ReFS, you will notice the advanced attributes is missing. 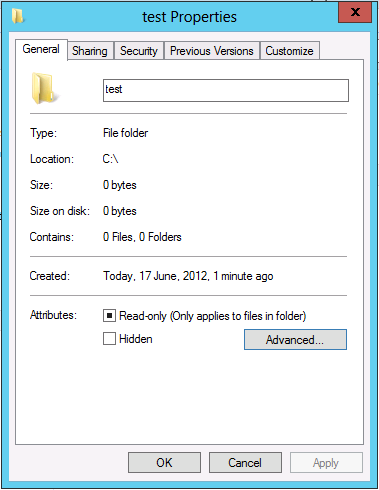 The next awesome feature in Windows Server 2012, not you can do a windows check disk without rebooting the server. What this mean is, we can perform maintenance online. Looking at all the ReFS features, you might have some idea where this can be used. Those highly critical application or DB, this would be an good option to use for storage which are fully compatible with storage spaces. If you would like to know more about storage spaces, please do visit this link. I have shared the idea behind it as well the setup configuration.